At the time I thought I could squeeze all the electronics needed to power the thing inside its bottom battery compartment. But I gave up on that; too cramped. So recently I finally put together a separate box that has all the power supplies needed plus some meters to show you what’s happening. The display at the top left gives the approximate value of “B+” divided by ten. Below it is the voltage on the plate, also divided by ten. There is a 6,000 ohm resistor between B+ and the plate (or anode). The top right display shows heater voltage, measured directly. And below it is grid voltage, which is actually an inverted copy of the actual grid voltage, which is negative. Here we have the heater at about 5 volts, the grid at about minus 3.5 volts, and B+ at about 136 volts. 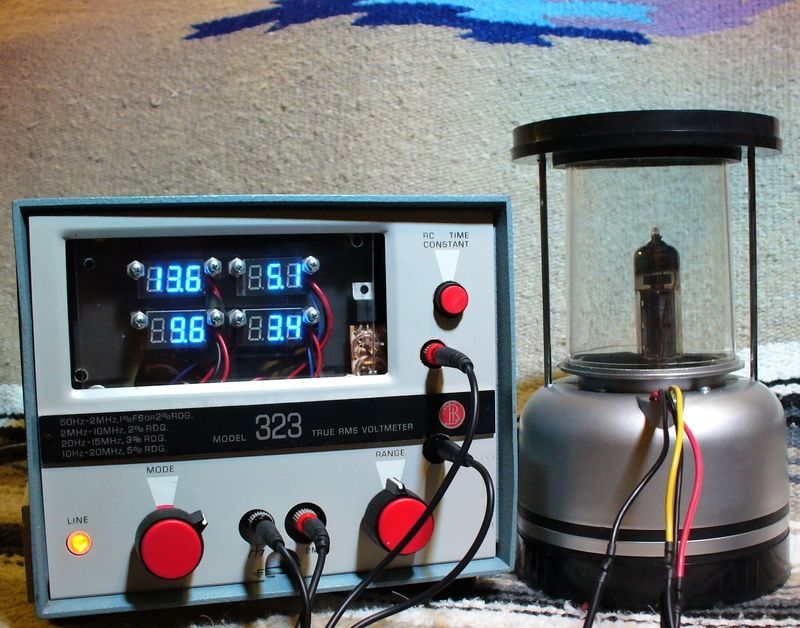 The plate is at 96 volts indicating that the tube is conducting about 136 – 96 / 6,000 amps = 6.7 milliamps. This tube is actually rated for 6 volts on the grid, a B+ of about 200 volts and plate currents of up to 30 or 40 milliamps. So I’m not stressing it (or my box) out too much. Almost all of the materials used in this project are used. The enclosure still has its original panel label on it; a very nice aluminum enclosure. The electronics inside were cool for their day but have almost entirely been replaced with computerized equipment. The power supplies (4 – 48 volt switching supplies plus an 8.5 volt switching supply for the heater) are all used. The digital meters are new, as are most of the control electronics (but purchased from surplus suppliers Jameco and All Electronics). I was glad to get this one materialized, as it was harder than I thought it would be. Here’s a skimpy shot of the beginnings of an electronic percussion instrument. Most of this is new equipment, but not expensive. What you see here includes a stage rack made of black aluminum tubing, one of two BOSS percussion pads which I have had for a long time, and two new KAT pads. Each of the KAT pads has 4 sections, so the whole instrument has 10 striking surfaces in all. All the pads output audio samples of some preselected sounds. 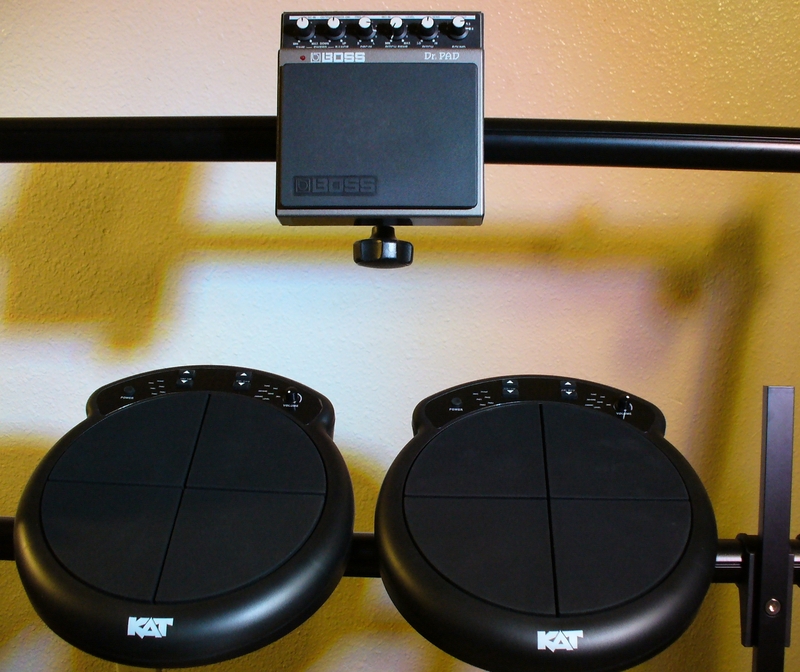 The two KAT pads also output MIDI control signals, so I can attach them to a synthesizer and play any sound I want. Also hiding underneath these pads are used tube clamps from All Electronics. These are an important part of the project as I did not know how I would secure the pads to the stand. The clamps required adapter plates to convert from the hole pattern on the clamps to the hole pattern on the pads. For these I employed 1/8-inch-thick aluminum that was also being sold as used/surplus. 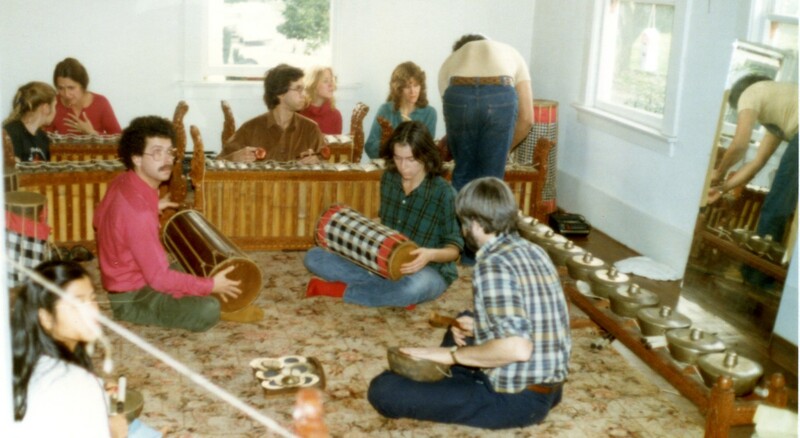 One of my inspirations for building an electronic percussion instrument was Gamelan Sekar Jaya, which I participated in for a year in 1980. There is the backside of I Wayan Suweca, the Balinese teacher who showed us all how to play our parts. At center-left (looking up) is Michael Tenzer, the original mastermind behind this gamelan, who bought the instruments in Bali. He’s now a music professor at the University of British Columbia.